Open the datasheet of the device on your custom hardware (If you are following the example in this module, the PIC32 device part number on the PIC32MZ EF Curiosity Development Board is PIC32MZ2048EFM100). Note the document number from the footer. 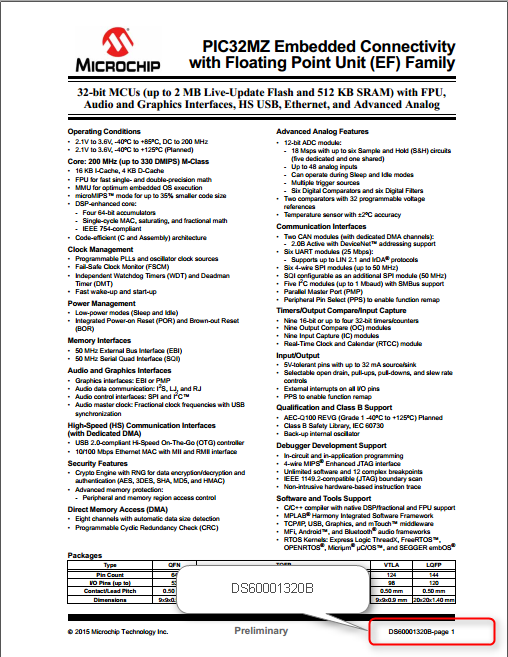 The document number for the PIC32MZ2048EFM100 data sheet is DS60001320B. 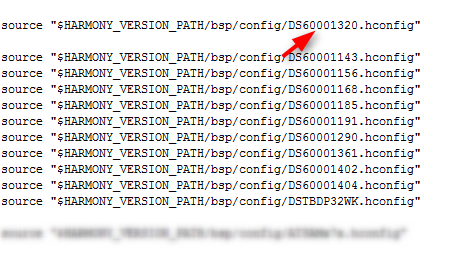 Open the bsp.hconfig file from location <harmony installation folder>/bsp/config. The bsp.hconfig file will have references to the documentation numbers of PIC32 devices. The PIC32MZEF Curiosity Development board with part PIC32MZ2048EFM100 document number is DS60001320. Verify that <document number>.hconfig is included in the script. For the PIC32MZEF Curiosity Development Board this document number is included in the script. If it is not included, you need to include it in this place. If it is already included here, nothing more needs to be done. The script in the .hconfig files is sensitive to whitespace. Ensure that there are no extra spaces or tabs in the script you add or modify. The custom BSP you are developing should appear as an option in MHC GUI when the PIC32 device on your custom hardware is selected during the creation of the MPLABX project. For this, you have to modify the PIC32 device hconfig file. For PIC32MZ2048EFM100 it is DS60001320.hconfig. This file is located in the folder <harmony installation folder>/bsp/config. Adding the configuration for custom board. bool "PIC32MZ EF CUSTOM Development Board"
Notepad++ software can be used to remove the trailing spaces. Follow the below steps to get rid of the trailing spaces in your .hconfig file. Open the .hconfig file in the Notepad++ Editor. 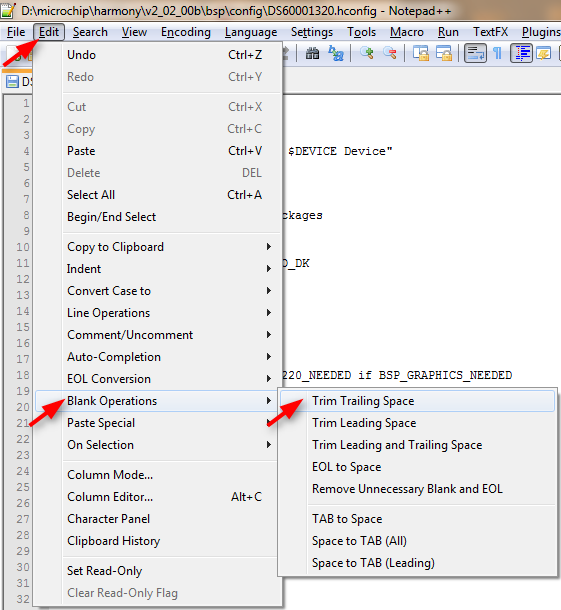 In the editor go to Edit > Blank Operations > Trim Trailing Space (see accompanying screenshot). If there are trailing spaces in the .hconfig file, you will get an error while trying to open the configuration in MHC. Adding the path for the bsp.hconfig for the custom board.